This year the German Development Day (Deutscher Entwicklungstag) took place for the first time on a nationwide level. Many organisations who are involved in social activities in Germany and abroad presented their work – and we took part! The team of Kids of Maseno e.V. informed about the association’s projects and objectives. Visitors showed great interest in our work. For us, this interest signifies another step forward in supporting Deaf and Deafblind children with their schooling. We would like to thank our supporters and members for their conceptual and financial support! Our association Kids of Maseno e.V. supports Deaf and Deafblind children with their schooling. This year, we welcomed a new member into our association. Maria Scherer who had conducted an internship from October until December 2012 in Maseno, decided to join our team. She will counsel our future trainees. In October 2013, the new executive board was elected. Sandra-Katharina Ochsmann, née Groß, finished her work as assistant chairperson but remains member of our association. 2. We have moved: Change of address of Kids of Maseno e.V. “Your commitment. Our future.” was the theme of the German Development Day (Deutscher Entwicklungstag) which took place this year for the first time on a nationwide level. 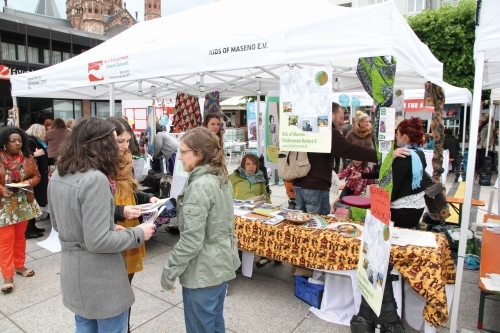 All over Germany, social associations and organisations informed the public about their activities. A broad variety of civic commitment in development cooperation was thus displayed. “The German Development Day is a good idea because… making a personal commitment to a fairer world should be of anybody’s interest” was our slogan. In Mainz we informed visitors about our work and our projects. 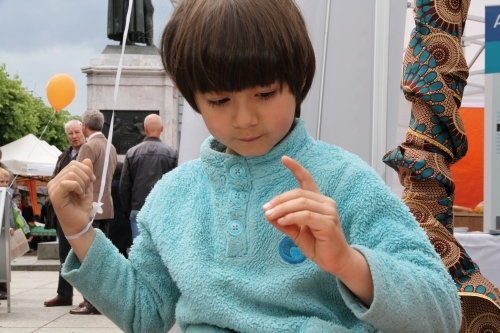 In a playful manner, we tried to raise awareness of the sensory perception – children and o ther interested visitors could touch and feel different objects and materials at our booth. We also distributed and explained the alphabet of the German sign language. “The sale of chicken goes very well”, told us James Arua from the Kids of Maseno team in Kenya. The electricity costs of the children’s home can be partly covered by this sale. At the end of this year, some chicken will be sold in order to supply the children with school material in 2014. The rabbit breeding is also working out well. The rabbit population grew from the initial two rabbits to over 50 rabbits this year. Some of them will also be sold on the market. The cultivation of vegetables is also successful. The success in animal breeding and farming already inspired Austine Otieno and other team members in Kenya to develop new projects. The team plans to buy dairy cows and to create a pond on the neighbouring land to breed fish. Austine already talked to the landowner about this project and is looking for new sponsors. As godparents, you are assisting the Kids of Maseno with their educational career. We thank you very much for your support! Even though the contributions for sponsorships had been slightly raised, it gives us great pleasure to report that we were able to continue all sponsorships. 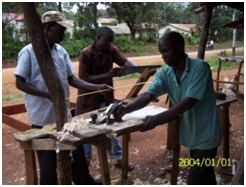 Victor Otieno who was formerly sponsored by us, is now a trained carpenter – thanks to your contributions! He is currently looking for a place where he can open his workshop. We hope that he will be successful. Of course, support for Victor is always well received. This year again, we offered young people the possibility to complete an internship at the Ebukuya School for the Deaf close to Luanda. In order to improve our programme for the trainees as well as for the team in Kenya, we consider the collaboration with bigger development policy organisations. A co-operation could bring the advantage of a more intense preparation for and follow-up of the internship. It could also help to increase the cultural awareness of our trainees as well as help with a compensation for the expenses of our trainees. We are still in negotiation with some organisations. For now, we proceed as before and we could already win a new trainee for 2014. Luisa Dreke will leave for Kenya in February and will stay there for two months. She will complete her internship at the Ebukuya School for the Deaf. Luisa Dreke studied rehabilitation sciences as well as blindness and education. She took Asian and African studies as a minor subject. We believe that she is well prepared for her trainee at Kids of Maseno e.V. and we are glad that we can offer her the possibility to put her theoretical knowledge into practice. We are looking forward to hearing from her. Every year the ‘Deaf Week’ takes place in Kisumu. The ‘Deaf Week’ is an event where different local organisations advocate the rights of persons with disabilities. This year’s theme was ‘Equality for Deaf people’. The children from Maseno took part in the event and performed a dance. Our Kenyan team members offered workshops in sign language and presented our association. Austine told us that many people came – Deaf and hearing people alike. We are very much pleased with these developments towards a barrier-free society. 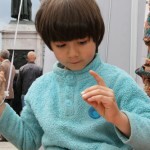 Austine also reported that more and more people are interested in taking sign language courses. Especially university students and residents of the community register for the sign language courses and thus show their interest in communicating with the Deaf people of their community. Austine and the rest of the team in Kenya try to raise further awareness of the Deaf by visiting parents and other relatives of the school children in their homes. They encourage relatives to establish close relationships to their children with disabilities. As we reported before, disabilities are often regarded as a social stigma in the Kenyan public. This leads parents to distance themselves from their children with disabilities. Our team members in Kenya work against this exclusion and discrimination. Thus, they organised a parent-teacher conference in November 2013 where they spoke about these problems and the importance of the family for the development of the children. In 2014 our Kenyan team will also focus on the theme ‘pregnancy and prevention’ to lessen the number of girls that has to drop out of school because of pregnancies. We are still aiming at concluding our children’s home project. We will try to gain new sponsors also for our other projects and we will inform about these projects on local festivals and markets. Your support is always welcome! If you have any friends, family members or other acquaintances that might be interested in our work, please refer to us and tell them about our homepage. Together we can raise even more awareness for integration and equality. Let’s get started! With this in mind we would like thank you for your support and look forward to future co-operations!